What if you could challenge your eighth graders to strengthen the nation’s infrastructure by designing bridges that last longer? With this volume in the STEM Road Map Curriculum Series, you can! 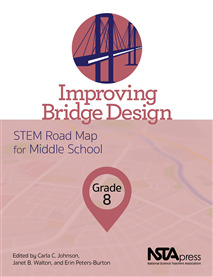 Improving Bridge Design outlines a journey that will steer your students toward authentic problem solving while grounding them in integrated STEM disciplines. As are the other volumes in the series, this book is designed to meet the growing need to infuse real-world learning into K–12 classrooms. •	Explore the current state of infrastructure in the United States and in their community, with a special focus on bridges. •	Construct scale models of bridges using scale factor, and explore types and parts of bridges using linear equations and models. •	Research and compare minerals and rocks involved in bridge building. •	Investigate the costs of building and maintaining bridges and of designs that could be more sustainable over time. •	Develop a decision model to help their local department of transportation select future bridge designs. •	Debate whether the U.S. government should establish another Works Progress Administration to improve the country’s infrastructure.